We’re pleased to announce the latest release of jQuery: jQuery 1.1.4. Barring any horrible mistakes, this release will be the last of the 1.1.x branch – leading us up to the release of jQuery 1.2 in September. A number of improvements have gone into this release, in addition to all of the normal bug fixes. You can now include multiple versions of jQuery, simultaneously, on the same page. What would a release be without some speed improvements? We took the opportunity to step beyond any previously-released speed test suites and improve the speed of the three most commonly used portions of jQuery: ID selectors, tag name selectors, and each() loops. It’s absolutely critical that each of these items are made as fast as possible, as they have the possibility of being re-used endlessly, and repeatedly. Here’s the test suite used to analyze the speed of the three changes. This is very big news – and should be especially so to most developers out there. The jQuery test suite has been completely re-tooled and improved from the ground up for stability. A brand new swath of Animation and Ajax tests have been integrated bringing jQuery’s total test count to over 800 tests! In the future, we’re working to improve our coverage of the Event, Attribute, and CSS portions of jQuery – undoubtedly bringing us to over 1000 tests very soon. 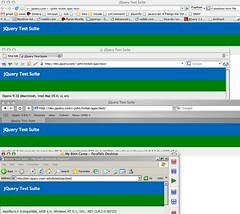 Additionally, it should be noted that the jQuery test suite is now embedded in the Mozilla test suite – running against every commit of the upcoming Firefox 3 release. You can feel safe knowing that in the newest release of Firefox, everything will just keep working, as you would expect it to. 53 tickets have been closed for this release. You can read the full details on the the bug tracker (this includes fixes that went in to jQuery 1.1.3.1). A bunch of large issues were resolved, including issues related to HTML script evaluation, Safari CSS Computed Style access, and Ajax settings manipulation. A couple pieces of new functionality have been introduced. The first two of which, .slice() and :has(), are going to be a part of jQuery 1.2, but their existence is obligated by some deprecated functionality (see below). The new changes to extend() and noConflict() were put in order to be able to fix some long standing bugs in jQuery. We are deprecating a number of methods in jQuery 1.1.4 in preparation for the API changes in the upcoming jQuery 1.2. Wherever possible, we’ve provided alternate methods for performing actions. With jQuery 1.2, as with the jQuery 1.1 release, a backwards compatibility plugin will be provided. Thus, if you wish to continue using these particular techniques, you’ll be able to use that plugin and continue doing so. Additionally, in order to handle the XPath changes another, separate, plugin will be released that will handle XPath selector functionality in jQuery. This plugin will be made available along with the jQuery 1.2 release. Please use the CSS $("div p") selector instead. Or, when jQuery 1.2 is released, use the new XPath Plugin. Please use the CSS $("div > p") selector instead. Or, when jQuery 1.2 is released, use the new XPath Plugin. Please use the $("p").parent("div") selector instead. Or, when jQuery 1.2 is released, use the new XPath Plugin. Please use the new $("div:has(p)") selector instead. Or, when jQuery 1.2 is released, use the new XPath Plugin. Note: While this selector is being deprecated in this release, it will not be removed in jQuery 1.2. Come jQuery 1.2, it’ll be recommended that you use the CSS selector $("a[href]") instead. Or, when jQuery 1.2 is released, use the new XPath Plugin. Calling the clone method with an argument is being deprecated (the clone method, as a whole, is being kept). Instead of calling .clone(false) you should now do: .clone().empty() instead. This method is no longer necessary in jQuery – all scripts included in HTML strings are automatically evaluated when injected into the document. No substitute method is needed. As always, please let us know if you encounter any bugs in between jQuery 1.1.3.1 and jQuery 1.1.4. Thanks!